I've been meaning to write this post for a while but kept forgetting. A couple of other posts recently reminded me to get it done, because there is a lot of misconception going around about what constitutes a long-tail keyword. The length of the keyword, the number of words in it, has NOTHING to do with it being considered "long-tail" or not. I have seen quite a few times people saying a long-tail keyword is a keyword with 4 or more words. I've even seen them called "long-tailed" keywords, again because of the misconception that the keyword itself has a long tail. Nope. That's not where it comes from. Long-tail is actually referring to a group of keywords, and it refers to their popularity. In this graph, picture "Popularity" as search volume, and "products" as keywords. The most popular keywords, the ones that get thousands of monthly searches, make up the head of the graph, and the less popular keywords make up the long tail. So a keyword can have 6 words in it, but if it brings in 10,000 searches per month, it's going to appear in the head of the graph. Conversely, a keyword could have only 2 or 3 words in it, but if it only gets 10 searches, it's long tail. What makes them "Long Tail" is that if plotted on this graph, they would appear in the lower end, simply because they have low popularity. 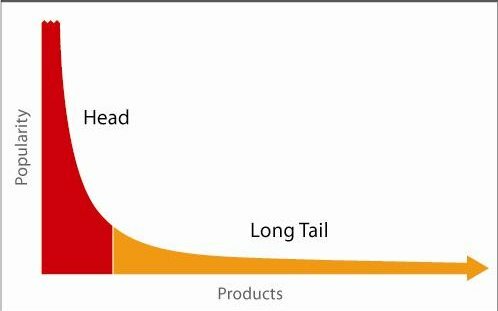 Another way to understand it is to think of other ways people use "Long Tail". For Amazon, we are considered Long Tail affiliates, because there are lots of us, and each one might only bring in a few hundred dollars a month, or even a few thousand. Meanwhile, there are the huge affiliates like Huffington Post which earn 6 figures per month from Amazon, but because there are only a few of those sites, they're classed in the head section, not long tail. Hopefully that made sense and helps you understand that Long Tail keywords are just the ones that appear lower down the graph in terms of monthly searches, but make up a huge group en mass. Why Does This Actually Matter? It's true that the vast majority of long-tail keywords are going to have more words, and the vast majority of popular "head" keywords are going to be shorter. The longer a keyword gets, the fewer searches it's likely to have. But it's important to understand the distinction, or you might target the wrong keywords. I've seen people say they're targeting long-tail keywords and wonder why they're not getting traffic, when in fact they're targeting keywords that are super popular, and just happen to have 4 or 5 words in them. "How to make money online" is an example. It's not a long-tail keyword. Also, the reason the tail is long, is because there are SO MANY of these keywords. They might only have 100 searches, or 50 searches, or even 10, but there are lots of them. That tail is actually never ending. So the way long-tail keywords appeal to us as Internet Marketers is the sheer number of them we can target. The basic strategy with using long-tail keywords is to use dozens of them, hundreds even. This way, you won't rank for all of them, but there are so many for you to collect, that traffic will just trickle in to your site for all of them, and that soon adds up. Compare that to trying to target 4 or 5 super competitive "head" keywords, where you'll get nowhere. If you want a rule, I would say anything with 250 searches or fewer could be considered long-tail (even if it only has 2 words). So there you have it, my attempt at cutting through some of the myths about long-tail keywords. Use this information to make better choices about the keywords you target, and to understand the overall strategy better. I have 'really' been following you here lately (no... not stalking, lol)! I’m confused… first of all, is my keyword phrase long tail or short tail? I think it is short tail because the searches (I believe that is AVG?) is under the 250 searches. Is my thinking here correct? Also, do you think my keyword phrase is good? The reason I am doing reviews on both the liveaboards is that they are identical. Both are popular liveaboards in the Maldives and I want to capture both of them to my readers. Thank you, Dom and I'm sorry to bother you with this. Hey, ok so you are thinking about this in the right way. 1.) It's long-tail. Long-tail = less popular. 2.) I would create two posts. - "Scubaspa Ying and Yang reviews"
- "The top liveaboards in the maldives". People who are searching for "liveaboads in the maldives" probably want to know different options, so even if you ranked your scubaspa ying/yang article for that keyword, they would be less likely to click it. Also if you Google those keywords yourself, you'll see that for "liveaboards in the maldives" the articles which are ranking are posts which list multiple options. If you're ever unsure how to do it, think about what people searching for those terms are looking for, and Google them yourself to see what Google is already showing. Hey DomW... I need a drink. First, thank you for taking the time to respond back and help me on long tail keywords. I would have responded earlier but… I’m focusing on getting this to ‘sink’ in my mind, Dom. I want to be able to choose my keywords the proper way (I have a feeling I have been doing this wrong for a long time). Ok, I just finished writing a review a couple of days ago with the following keyword phrase ‘Scubaspa Ying and Yang Liveaboards in the Maldives Reviews’. The good thing is, it’s not published yet and I can still change the keyword phrase to “Scubaspa Ying and Yang Reviews” as you suggested but I’ll add “For New Divers”. I understand that this is a long-tail keyword because it is not popular and I did go back and look in Google’s search browser. It doesn’t even look popular in Google’s search browser. (What was I thinking?...). No worries… I’ll get better at this! After reading what you have been saying, even though this unpopular long-tail keyword may rank and even be on Google’s first page, people may not read it. (Ok, so my thought is…I write a new article “The Top Liveaboards in The Maldives” like you suggested. It will include the Ying and the Yang Liveaboards, in fact they received awards. When I mention these two liveaboards in this new article, I’ll put an internal link going to my Scubaspa Ying and Yang Review For New Divers. That should bring in people to hopefully read the review, correct? It’s funny (not really… I’m just laughing at myself..lol) that when you mentioned that I should think about what people would enter in the search browser on a keyword I’m unsure of….I did do this even before I selected the unpopular long-tail keyword. Darrrrggg.. my lightbulb didn’t click. In my mind, I was thinking I needed something more specific, hence the ying and the yang liveaboards came into play. Also because I love all the features of the two liveaboards. 1. If I want to write about a relevant topic, I need to think about what people would enter into the search browser on this topic. For example, I want to write about liveaboards in the Maldives. This makes perfect sense and I get it. 2. The idea is to find a long-tail keyword that is popular that has around 250 searches. When you say searches, you mean traffic (AVG in Jaaxy) correct? 3. So the ‘How to Make Money Online’ has 5 words and it’s very popular, as in AVG = 156,866. This is a short-tail keyword because it’s wayyyyy too popular?? When I look in Jaaxy, the QSR is 258 which is quite high and is a poor keyword. But, “How to make money online for real’ has AVG = 217, QSR = 99, SEO = 90. This is long-tail keyword?? When I google this, it’s doesn’t seem like a good keyword. Yikes… I think I’m confused again. Thank you Dom for your help... can you please straighten me on my questions and in particular on #3? Long tail doesn't mean "unpopular" it just means "less popular". But there are tons and tons of these long-tail keywords (that's what the long-tail refers to, on a chart of popularity, they are towards the end, but there are hundreds of variations of the same keyword). So you WILL get traffic to them. You don't need to aim for 250 searches, 50 searches is still good. And I mean searches not traffic. Traffic is just Jaaxy guessing how many visitors you'll get if you rank in the top 3 for those keywords. Since these are long-tail keywords and if you rank for 1 of them you will rank for hundreds of them..those estimates are not accurate. That's the point of the chart I posted in this post. Lol.. I had to read this a few times to let your post and your responses sink in. I believe I understand..
*Long tail of the graph = less popular keywords. BUT because there are a huge amount of the long-tail keywords (hence, your diagram showing the orange with an arrow). There are many many variations of the particular keyword. I can get traffic on them. Thank you for explaining the Traffic in Jaaxy. Searches are NOT traffic. I changed my unpublished post title to "Scubaspa Ying and Yang reviews" and it is a long-tail keyword. I'll write a new post with the title "The top liveaboards in the Maldives", also a long-tail keyword. I see on Google, most of the posts have listed options and it does make sense. In fact, this is what I would be looking for myself. I got this right... right? Yep that sounds like you got it! Thank you for your AWESOME HELP and for taking the time to explain this to me. Much appreciated! I even made my own notes. I have this bookmarked, in the event I digress (brain-fog). Great! I think other people will read this little conversation in the future and will benefit from it too! Yep... I believe other members will find the conversation very helpful. I'm really glad you're here to help people like me...lol!! Have an amazing week Dom and thanks again!! How are you doing on your site? Thank you so much for explaining this in such a fab way! Really super-useful! Thanks Dom. Great post and info. Very helpful. Thank you for your enlighten - head and long tail. You said long tail can even become head, If a keyword can have 6 words in it, but it brings in 10,000 searches per month, it's going to appear in the head of the graph. This is well understanding because that 6 words make sense and value. You cannot just use 3 words or 4 and the headline make no sense, it will not lead to any traffic. Use captivating words that is valued, even it is up to six words you will get thousand of searches per month. Thanks for the post and its an eye opener and now I clearly understood the long tail keywords thanks a lot! Great explanation.....saving it for reference. I found this very helpful, Dom. You explained it clearly and it's easy to understand. I was on the right thinking with this, but your post pushed me the rest of the way through the door. Thanks for sharing this, Dom. It certainly clears up some misconceptions of what constitutes a long-tailed keyword. Thanks for this post. It clears up a lot of my questions concerning long-tail keywords. In all the research that I have done on this subject, this is the first time I have seen it presented this way. This is something new to learn today. What a wise teacher we got at WA for all of us. Choose keyword with 250 searches or less even though it has only 2 words in it. That word doesn't make sense, but it's a search term, so I want to add WHAT causes colic in babies. Now is "Causes colic in babies" a long tail keyword because it has under 100 searches a month? And what happens when I add the word "what" before the keyword? This would help me tremendously in understanding this. Hello, Linda. I think that it doesn't make such a big difference which of them, you're going to use. Both have the same meaning and their AVG is above 100 and their QSR is below 100. "Causes colic in babies" is your keyword. "Top 5 Causes Of Colic In Babies" is another option (perhaps another post). Arguably you could be ranking as well for "Top 5 Causes of -keyword" and for "What -keyword", but you will likely also rank for the main long tail keyword causes colic in babies. In fact, you might also be able to rank for "colic in babies" although the KQI is rather poor for that head keyword, with QSR above 300. Focusing on a large number of keywords that have low search volume. I love the days when I return to one post and find several others that are just jam full of great information. Thank you, thank you, Dom! Wouldn't it still be better to use a keyword with really high searches and really low competition? Regardless of what it is called? I understand we don't want to go after high search and high competition keywords, but isn't high search, low competition better than low search low competition? Thanks for defining what a long tail keyword is though. Does that mean that keywords (long-tail or not) with monthly searches under 50 or under 200 are worthless? No, they are valuable - read Bamanand's reply below. The long-tail keyword has nothing to do with the number of the words in it. Long-tail means keyword which is very specific and it usually has fewer searches and less competition than the general search term. Most of the time specific search terms have more than 3-4 words so people get confused as you have described in the post. One thing I like to do when choosing a long-tail keyword is I target the keyword that has many others relevant search terms. That way I get more clicks and better ranking for those keywords that I haven't targeted directly. That actually supports what I'm saying. When you plot a graph by popularity, you get the less popular searches in the long tail and the more popular searches in the head. What puts them in the tail is their search volume, not the number of words or the specificity. 99% of the time, a more specific keyword will be long tail, just like a longer keyword will be long tail, but the point I'm making, and the point the article makes, is that it's the popularity which defines it long tail. Specificity is just a great way of finding them in the first place. According to you, low search volume keywords are long tail keywords and should be targeted. But for niches like web hosting, most low search volume keywords are still very difficult to rank on the first page. There are always going to be exceptions. This post is a definition of a long-tail keyword, which those examples above ARE. You can't argue that they're not long tail keywords. It's also pointing out that the idea with long tail keywords is that there are an almost infinite number of them (again this is backed up by the post you shared with me). Pull out any keyword in isolation and you'll be able to find exception. You've pulled one of the most competitive seo niches on the planet out and picked two examples, when long tail keywords are all about the fact there are loads of them. Either way. Long tail keyword = less popular. Also, where in my post does it say you should target a low search volume keyword purely because of the fact it's low search volume? My post is about dispelling the myth on the definition of a long tail keyword and how the strategy works based on the fact you target a number of them. You're arguing something different and backing it up with evidence which supports what I said. Hey Dom, don't get me wrong. I am not arguing about the definition of "long tail keywords". You definitely have 100 times more experience than me. I read all of your posts on HPD. I am also one of your subscribers and learnt a lot from you. My intention was not to prove you wrong anyway. I just wanted to say, a keyword is worthless if it is not easy to rank and should be avoided even it is less popular. 2.5 years ago, when I was a newbie, I chose a competitive niche and I targeted keywords (less popular) but did not get better rankings because at that time I did not know about the SERP competition. OK fair point, thanks for clearing it up. As Kyle always says aim for low hanging fruit. Low competition with a few searches (the more the better). These then add up and provide a steady flow of traffic. As with all things in SEO there is no perfect pigeon hole some times it works and others it doesn't. Checking out the top ten posts quoted for your keyword is also important and usually means the difference of slotting in there or not. Good post Dom all the same, I was ignorant until explained. I did not know this about long tail keyword and what it actually meant so I'm definitely glad I read this article. it's a big help. Thank you! Great post! Thank you for clarifying! Thanks for explaining this, I had misunderstood this term as well. Wonderful post , and this eradicates any confusion of what a "long-tail" keyword actually is. Vital information..
Bookmarked in the Folder of Fame. Thank you Dom! That is hands down the best explanation of long tail keywords I've ever seen, Dom. Thanks! Now I really get it. Simply the best way to define and understand. Thank you, Dom. Thanks for the explanation. Never could understand long tail keywords. Now I do. Hi, Dom thank you for this post think that I get what you are saying, I have probably been laboring under a misconception. Long tail keywords become more specific, so allow us to rank better in search results for popular topics, doing this relatively quickly and over time allow us to gain ground on head keywords. There might be fewer searches but the traffic tends to be more focused so more likely to convert to leads and customers? definitely a work in progress for me thanks for the heads up. Great post Dom. I never thought about this as in depth as you put it. I am sure you cleared up a lot of thing for many of us. Thanks Dom for explaining elaborately on keywords. We keep learning new things. Is nr 2 long tail or is that just a head there too because of the main "how to make money online" within the phrase? as in I can find a simple head keyword and make it longer, but I still might get into trouble because of the main keyword within my longer keyword. Having the longer phrase isn't going to get negated by the existence of a shorter keyword in there, otherwise it wouldn't be possible to have any long phrase. Thanks for your answer Dom! Excellent post, Dom! Thanks for this information. I was one who wasn't aware of this. Much appreciated! Fantastic post. This should be added into the certification course. Most of my posts should be ;) But we'd end up overwhelming everybody. Nicely described and it was necessary, the misconception about those things with a tail is widespread. Yep, almost daily there are comments and posts about it which are wrong.